Those who speak about being on the “right side of history” have, knowingly or not, adopted a central element in Karl Marx’s analysis of capitalism and the idea that the capitalist system follows a particular course of historical development that is open to scientific explanation and prediction, and which presumes to be placing humanity on a road that leads to a higher and better form of society – socialism. Karl Marx and Frederick Engel’s Communist Manifesto was published in 1848. The first volume of Marx’s three-volume, Das Kapital (Capital), was published in 1867 (the other two volumes were edited and published after Marx’s death in 1883 by Frederick Engels). Marx was convinced that those middle decades of the nineteenth century were the twilight years of the capitalistic epoch of industrialization. His writings make it clear that he believed that the socialist revolution was right around the corner in his own lifetime. From the perspective of 2017 – almost a 170 years after The Communist Manifesto went to press – his view of the nineteenth century seems as nothing more than wishful thinking by an anti-capitalist revolutionary who wanted to believe that the “worker’s state” was just over the horizon. There is not much excitement in being a “scientific socialist” (nor are you likely to draw many followers) if your pre-vision of the future on the basis of your theory of historical development leads you to believe that the socialist revolution is coming – but only 200 years in the future! 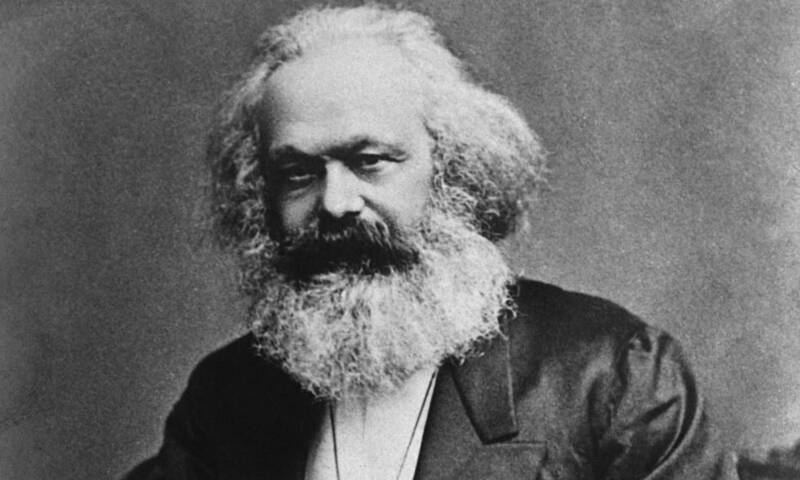 Marx not only misinterpreted capitalism’s “birth pangs” for its “death rattle,” but he totally misread how capitalism has actually evolve, considering that as an economic system it was just emerging when Marx wrote, and was not ending. “Bad timing” is the most polite way to express Marx’s misconception of where capitalism was on the time-line of modern history. Rather, the most striking social phenomenon of the last 200 years has been the widening and growth of a vast “middle class.” Instead of the “rich” and the “poor,” there is a spectrum of well to do to and not-very-well-to-do, with the largest proportion of the population in the most industrial countries being members of a huge middle class “bulge” along this spectrum. Rather than capital accumulation leading to a concentration of wealth and income, it has worked to disperse ownership and wealth among the members of industrial society. There have been at least two reasons for this development of capitalism. First, there has been the emergence of financial markets and financial intermediation. Modern banking and financial institutions emerged as intermediaries to collect and channel loanable funds from those who have greater or smaller savings to pass into the hands of those who have wanted to invest. To minimize the loss-risk from potential default on the part of borrowers, it was advantageous to disperse those funds to a wide spectrum of borrowers of varying size,s types, and degrees of risk with corresponding interest charges and collateral requirements. The flow of funds into a wide variety of investment hands, who otherwise would never have been able to start or expand various business ventures, created new and growing sources of wealth and accumulation as most of these borrowed fund’s for investments “paid off” through wise entrepreneurial use of that savings. That is, new capitalists, new property owners, new forms of capital accumulation were created. Rather than capital and wealth being concentrated, it became dispersed and widened as successful ventures generated profits from which new savings could be lent out to new borrowers through the same and expanding financial intermediary process. Second, Marx presumed that the technology of mass production would result in the homogenization of labor skills required for industrial activity, reducing it to the lowest common denominator for various tasks in the form of minimum “subsistence” wages. Industrialization, and now the “new world” of “high-tech” have, in fact, worked in the exactly opposite direction. The developed market economy has generated a demand for a wide variety and spectrum of labor skills and talents. The outcome has not been a homogenization of labor, but the heterogeneity of labor varying in value and type. Hence a wide range of wages has emerged, that is, not a common “level” of wages, but a “complex structure” of relative wages reflecting a refined distinction among workers and their specific talents and abilities in the market place. In addition, Marx failed to appreciate the actual production relationships between “labor” and “capital.” From one perspective, physical capital and human labor are potential substitutes for each other within various ranges and for particular purposes. But more fundamentally, “labor” and “capital” are complements in all forms of productive activities. First, as capital accumulation and capital investment occurred over the decades, productive capital has tended to increase faster relative to the increase in the labor force population. That is, labor has become the “scarcer” factor of production in comparison to “capital” over time. Hence, the value of labor has, in general, risen in comparison to capital. Second, the improvement of productive capabilities through capital investment has raised the marginal product of labor. That is, with better tools and equipment, the productivity of labor per man-hour has gone up, and, thus, the productive value of each worker has risen has well. Third, while it is true that the replacement of some workers through capital investment results in the loss of particular jobs, through time (since the same or a greater output can be obtained with fewer hands), this ultimately freed some workers for new tasks that could not be performed before. This creates new employment opportunities for work to be done that the society could not undertake earlier. Thus, a free market economy does not generate a permanent “reserve army” of the unemployed, as Marx predicted. Marx’s Erroneous Conception of Class Conflict. Following the lead of the classical economist, David Ricardo, Karl Marx took the view that the great “economic problem” to be solved was the understanding of how and why “income” was distributed among the “great classes” in society the way it is (in Ricardo’s case, the landowners, the capitalists, and the workers). However, complex capitalist society does not homogenize individuals in this fashion. Indeed, a growing number of people are simultaneously members of several of these “classes.” For example, an individual may work for someone (thus, earning a salaried “wage”), while also having a saving or mutual fund account of some size (thus, earning interest income); own stock in a company or corporation (thus, earning “capitalist” profit income), or possibly own a house or apartment building that he lets out (thus, earning rent as a “landlord”). If this is the case, to which “class” in Marx’s sense, does this individual owe allegiance? If anything, in a developed system of division of labor, the employees and the employers in a particular industry or manufacture tend have more in common with each other rather than with the respective workers or owners in another segment or corner of the market. Their common interest would be to use the government for forms of anti-competitive intervention to gain market share and profit advantages at the expense of producer rivals and consumers in the same or different markets for a greater amount of government assisted ill-gotten gains to divide among themselves. The classical economists distinguished between what they called “material” and “non-material” interests and motives. The core concept of the “classical” approach was that economics as a field of study was the science of the production and distribution of wealth. That is, the material activities of man in the pursuit of his survival and betterment. Marx’s “twist” on this approach, as we have seen, was his argument that man’s material (i.e., his production) side of life was the determining ingredient in establishing and dictating all other social, political, and economic relationships in the society. The “forces of production” (the dominant technology and the physical forms of capital in which it was embodied) determined the “superstructure” of the social order in the form of its institutions and human relationships. Matter and its form in terms of material forces of production dominate and shape “mind” and the formation of human ideas and social interconnections. In the late nineteenth century, economists increasingly came to see the scarcity concept as central to economic understanding. Economics was re-formulated as the study of the principle of economizing behavior under the constraint of means insufficient to service all desire ends. In the 1920s and 1930s, economists developed an approach that extended and refined the economizing idea even further. Especially through the writings of a number of Austrian School economists, most notably, Ludwig von Mises, Hans Mayer and Richard Strigl, and the British economist, Lionel Robbins, economics came to be seen as the Logic of Action and Choice: What delineates a field of inquiry for economic analysis is not the particular motives for which individuals undertake actions – that is, “material” versus some “non-material” goals – but on the particular relationships that imposes an “economic aspect” to all human action: That being the necessity to select among any and all competing ends when the means are insufficient to fulfill all of goals or purposes for which they might be applied. In this the individual compares all types of ends, regardless of their content. For example, the scarcity of time requires a choice between “working for money” versus doing some “charity work.” Or choosing between “bread” and “honor.” There is, therefore, nothing distinct about the “material-side” of life, other than the way means may be used to pursue one set of ends, rather than some others. In the most general sense, there is, indeed, no such thing as the economic future. There is only the future in which economic factors are bound together, inexorably and quite without hope of separate identification, with the whole universe of forces determining the course of events. This pattern of causes and consequences, even when looked at after the event as history, almost paralyzes the mind with its intricacy . . . If the economic future can, indeed, be described, why not also the scientific future, the political future, the social future, the future in each and every sense? A machine is a device made by man . . . To ascribe to a machine any activity is anthropomorphism . . . The machine has no intelligence; it neither thinks nor chooses ends nor resorts to means for the realization of ends sought. This is always done by men . . . In Marx’s doctrine . . . the production technique is the real thing, the material thing that ultimately determines the social, political and intellectual manifestations of human life . . . This fundamental thesis is open to three irrefutable objections. First, a technological invention is not something material. It is the product of a mental process, of reasoning and conceiving new ideas. The tools and machines may be called material, but the operation of the mind that created them is certainly spiritual . . .
Second, mere invention and designing of technologically new implements are not sufficient to produce them. What is required, in addition to technological knowledge and planning, is capital previously accumulated out of saving . . . The production relations are thus not the product of the material productive forces but, on the contrary, the indispensable condition of their coming into existence . . . Furthermore, it must be remembered that the utilization of machines presupposes social cooperation under the division of labor . . . How then is it possible to explain the existence of society by tracing it back to the material productive forces which themselves can only appear in the frame of a previously existing social nexus? Machines, technologies, methods of production, emerge out of men having goals, and trying to figure out ways to attain them through devising means to construct those machines and tools for various purposes. Ideas, in other words, create machines; machines cannot and do not determinately create ideas. Why one particular set of goals rather than others? Why the human creative process resulting in a specific form of technology, and not some other? Why it’s application in one specific manner rather than some potentially different alternative? The bottom line is – we do not know. All that man is, is ultimately matter (as physical beings), but how and why the physiology of men results in one set of ideas in their minds rather than some other set of ideas has never been answered. Marx, like many in his generation, was enthralled by the idea of the physical sciences as a key to all the mysteries of the universe. If only the correct “first principles” could be unearthed, the history of man and the world would unfold before his eyes – like the clicking of the tumblers in a lock that opens the door of a safe. We do not know the origins of ideas. Historically, the development of a set of ideas within a particular individual can be traced, and the evolution of those ideas among individuals can be followed. But the way a certain new idea entered someone’s head at a certain time in the form that it did is not answerable in any deterministic fashion. All we are able to see is that there is “mind” and there is “matter.” They do interact. But “mind,” as far as we can see as human beings, ourselves, is not a simple and simplistic “dependent variable” whose content can be read on a curve once we know the particular value of the physical “independent variable” impacting on man in some way. The course of human history is strongly influenced by the growth of human knowledge . . . We cannot predict, by rational or scientific methods, the future growth of our scientific knowledge . . . We cannot, therefore, predict the future course of human history . . . This means that we must reject the possibility of a theoretical history; that is to say, of a historical social science that would correspond to theoretical physics. There can be no scientific theory of historical development serving as a basis for historical prediction. In other words, we cannot know tomorrow’s knowledge today; otherwise it would already be known and not something unknown and unknowable ahead of us. But what course the future holds in store is not only dependent upon the knowledge that individuals may acquire at various moments ahead, but how they understand and interpret that knowledge in the context of all they know and have experienced up until that time, and how they see its relevancy and usefulness given the goals and purposes they have decided to pursue and attempt to achieve (which are, themselves, open to change as time passes and new experiences teach new things to each and every one of us). How easy it is, as we look back over the past – that is, of course, the ‘past’ that has been selected for us by historians and social scientists – to see in it trends and tendencies that appear to possess the iron necessity and clear directionality of growth in a plant or organism . . . But the relation between the past, present, and future is chronological, not causal. How often the trends of the time seem inevitable and inescapable! Most people at the beginning of the twentieth century were confident that after all the political, social and economic achievements of the (classical) liberal order of the nineteenth century, the new century just dawning could only promise more personal freedom, greater material prosperity, and a likely secure peace for mankind. Few imagined the human and material wreckage the “Great War” of 1914-1918 would soon bring upon humanity. Many friends of liberty alive in the mid-1930s were deeply despondent, fearing or even believing that the epoch of freedom was ending with the rise of modern collectivism in the forms of the communist revolution in Russia, the fascist movement in Italy, the rise of Hitler and the Nazis to power in Germany, and the establishment of the New Deal in America. And many were concerned that another great war was coming that would end civilization as mankind had come to know it with the triumph of totalitarian collectivism everywhere. It did not turn out that way. During most of the post-World War II era that began in 1945, many in the West were certain that Marxism, led and inspired by the Soviet Union and then Communist China, meant the end to liberal democracy and any form of market economy. Many of those of “the left” in the West could not wait for the day when some form of socialist central planning would prevail everywhere. Those on the political “right” feared and despaired whether “the West” still had the character and convictions to oppose and triumph over communism as an ideological and military force in the global struggle of the Cold War. It did not turn out that way. In the 1990s, after the fall of the Berlin Wall and the collapse of the Soviet Union, the new historical trends all seemed to be assuring a future for mankind of systems of “democratic capitalism,” with some even suggesting that with this stage of political and economic development humanity had reached “the end of history,” in some pro-capitalist Hegelian evolution. It has not turned out that way. Now in the twenty-first century, many of the readers of the trends of history are fearing the envelopment of parts of Europe by Islamic fundamentalism, or the rise of China as the new global power with a winning model of a form of authoritarian managed, crony capitalism, or the devolution of the United States under the pressures and forces of populist socialism, fiscal bankruptcy, and “progressive” political correctness. It does not have to happen that way. There is no “right side of history” in the Hegelian and Marxian sense. Those on the political left who, today, continue to use this rhetoric of right and wrong sides of history merely use an attractive catch phrase that gives them a feeling of possessing a moral high ground and that can easily intimidate those who are told that “progressive” policies – a kinder and gentler use of words than “socialism,” “collectivism,” “tyranny,” or “command” – represent progress. This is made easier when too many among conservative or even some classical liberal circles sometimes falter or even fail to articulate and defend a consistent political and economic philosophy of individualism, free market capitalism, and strictly constitutionally limited government. But it is nonetheless the case that a notion of a “right side of history” is an empty, meaningless phrase. History is the product not of mysterious forces beyond man’s and mankind’s control and power. History is the product and result of ideas – ideas about the nature of man, conceptions of how men could and should live together, and the political and economic institutional order of things that will best benefit humanity as the sum of the individuals making it up. What history has shown is that there has been greater human freedom, greater human prosperity, and greater human peace and tranquility during those times when the ideas of individual liberty, free markets, and limited government have most prevailed and been instituted in society. The greater the degree of government control, command, and coercion in society, the less these things have existed and blossomed. The task is not to be on some mythical “right side of history,” but to make history reflect the triumph and success of the idea and ideals of human liberty. But this does not just happen. It requires each of us to understand the meaning, value and importance of liberty in that classical liberal and libertarian sense, and to be willing to defend and advance it among our fellow human beings. That is what would make history.